A Photovoltaic (PV) system that uses micro inverters is the newest method to produce solar electricity. It is a Grid-Tied, Net-Metered system, but instead of having a single central inverter, there is one small inverter for every PV module. They are installed on the back of the module or on the same rails as the modules. The micro inverters convert the DC electricity from each module individually into AC electricity. This allows for individual module monitoring and control, as well as not having any high voltage DC in the system. 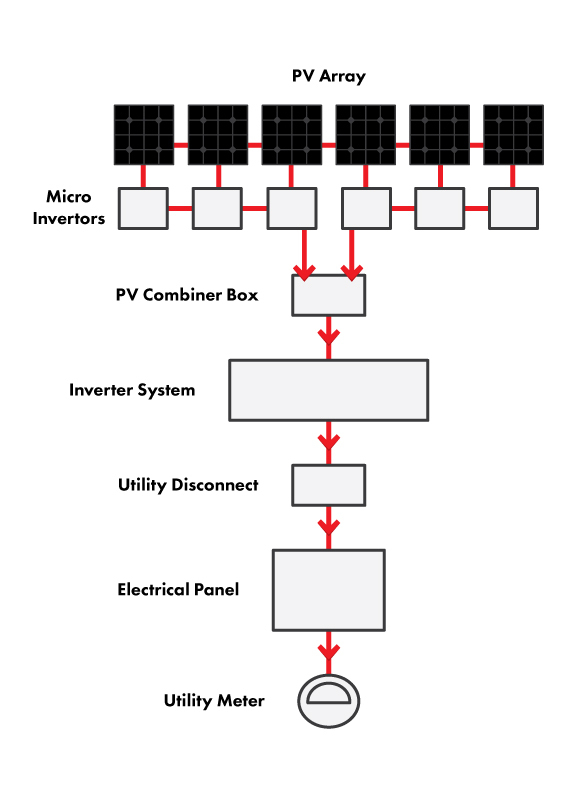 The micro inverters are connected in parallel, in groups or strings and then the strings are connected to the combiner box. The AC electricity from the combiner box then goes to the utility disconnect and then on to the main electrical panel. Any surplus energy not used by the loads in the electrical panel is “sold” to the utility grid. . New electronic power meters that read power flow coming and going track the energy sold to the utility. Here in Nova Scotia we have a Net Metering program that allows people to sell power to the utility, Nova Scotia Power Inc. The output of the micro inverters can be viewed for free on websites administered by the inverter manufacturer. Panels can be roof or round mounted. Panels can be 100 meters from House. Inverter located in under panels on rails. Utility disconnect is outside near Utility meter. Individual panel monitoring and control. Needs unshaded exposure to the sun. No backup power if grid is down.